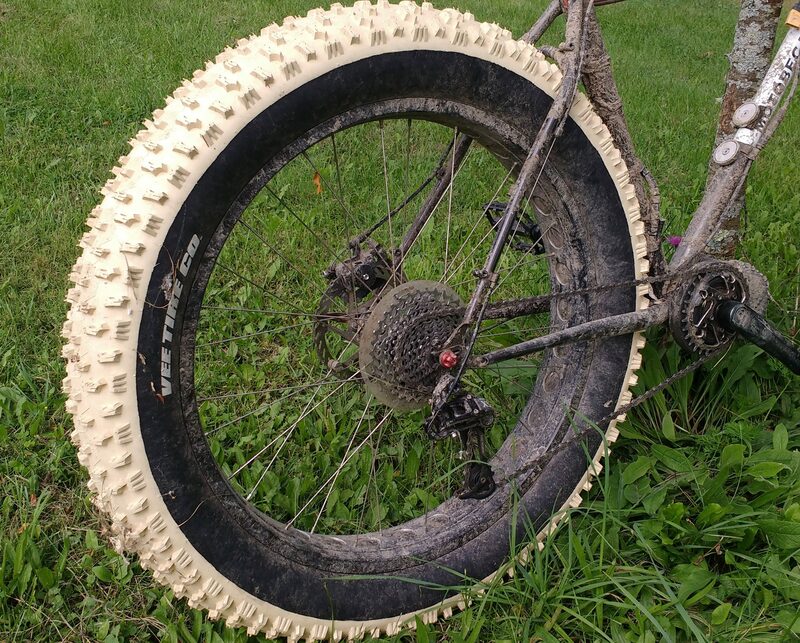 Last winter I saw that Kate Leeming was planning on bicycling across Antarctica and her weapon of choice was the SnowShow 2XL PSC (Pure Silica Compound) tire with white treads. 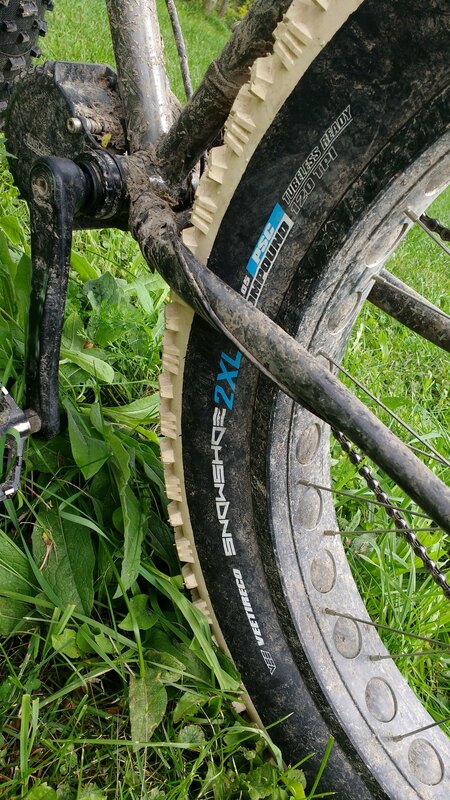 Although I had seen many people use the PSC tires on their fatbikes online there was something about having a white treaded tire that put me off. 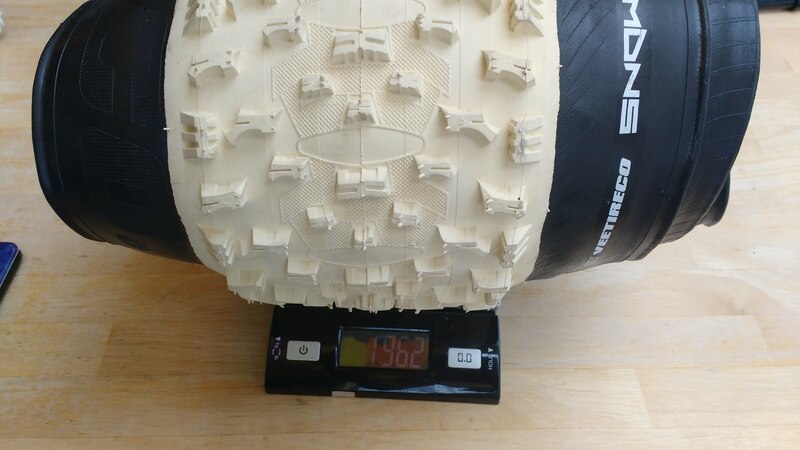 Late fall 2017 I sprung for a set of 2 Snowshoe 2XL PSC tires from ebay for about $219 and threw them on a Ludicrous powered Bikes Direct Lurch (review here) I had built up. Over the winter I became amazed at the traction and the snow shedding difference between the PSC compound and the standard black treaded Silica tires. Since I had two nearly identical ebikes, one at my house and one at my wife’s and would switch back and forth twice a week I became a true believer of the PSC compound and will probably never buy another Silica fatbike tire again if there is a PSC option to be had instead. Vee Rubber is the only fat bike tire company out there right now offering many of their tires in both Silica and PSC. The PSC looks pretty awful reminding most riders of a skunk stripe which ends up running down the middle of their tire (think reverse white wall). The area where the black part of the tire and the white part meet on the sidewall also does not quite line up and the line along the tire is pretty wavy. If you can get over the ascetics of the tire, the performance rewards for the PSC are worth it in the snow. Different rubbers have different softness indexes and the normal black silica tires are listed as 50A while the PSC is listed as 57A. More information on the rubber and casings of Vee Rubber tires can be found here. 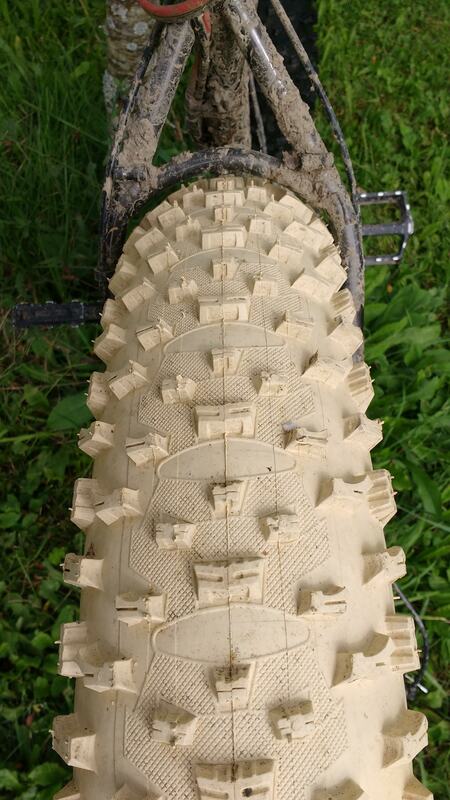 I have tested about 20 fat bike tires extensively and with the exception of the SnowShoe 2XL and the Bulldozer I have mostly found the Vee Rubber products to be wanting. The PSC tires command about a $15 increase in retail price over silica, but since the PSC has much lower demand you can often find them for dirt cheap online. I just bought 4 PSC 4.7″ Bulldozer tires from Amazon for $35 each here. For a tire that normally retails at $115 that is an insane deal to be sure. I can’t say enough good things about the SnowShoe 2XL PSC tire. Last winter I pushed the limits of what I thought possible with the Ludicrous controller bumped up to 60 Amps. I was able to ride consistently when the snow was close to a foot deep and as long as I kept my speed up was able to float up and ride really well. Although the Vee Rubber website says the low-end of the 2XL for pressure is 8PSI I often ran the rear tire down as low as 5PSI and the front tire down to 3 PSI. You get a lot to tire warping while riding but since there is no hard stuff like rocks and logs to hit in the deep powder you don’t have to worry so much about damaging your rims. The PSC compound seemed to grip noticeably better and even more importantly it would shed snow and ice really well. On icy patches, the PSC compound seemed to grip better as well. I rode with PSC tires on both the front and the rear and the PSC compound seemed to make a significant difference on both. On the front tire you notice the tire clogging with snow less and thus gripping better. On the rear tire when you spin out and start to get stuck the tire does not tend to dig itself into the snow and instead seems to have an easier time gripping and pulling itself out even before it digs down to the dirt. I’ve had to trim the outside lugs off a couple of snowshoe 2XL to get them to fit in standard fatty frames without rubbing. I’ve noticed that the PSC rubber is much softer when you’re nipping off the lugs than the normal black silica tires. Trimming lugs is a pretty extreme measure, but I’ve noticed that if the tire is rubbing and you don’t trim the lugs then you will quickly wear through the soft aluminum chainstays and are pretty much guaranteed to suffer a dramatic frame failure. When you’re out slogging it out in the woods in deep powder, and barely clinging to control as you weave in between trees it makes a whole lot of sense to give yourself any benefits you can. If you can score a PSC tire for the same price or even 1/4 of the price of a Silica tire and it’s going to perform better in the snow then why wouldn’t you do it? Who cares if your bike looks like a clown bike with its bright white skunk tread, you’re having more fun than everyone else and that’s what really matters anyway. Yeah with the 2XL on the front you don’t need a fork. Just run it at 5PSI. I’ve given up on all suspension forks entirely. I’ve destroyed 3 and have a couple more kicking around I never use. They just don’t work in the extreme cold.